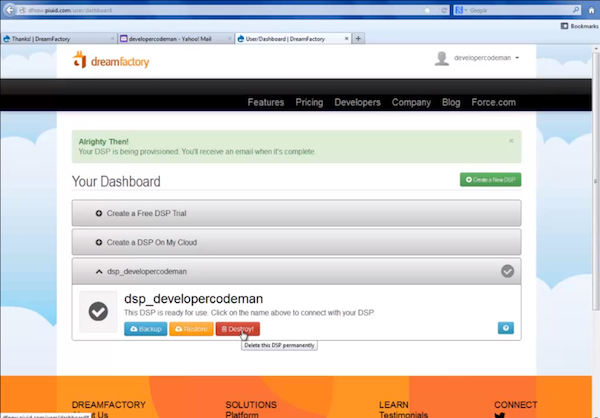 DreamFactory has launched an open-source platform for building mobile HTML5 and native apps. The DreamFactory Services Platform (DSP) is a standards-based, back-end server that can be installed on any virtual machine in the cloud or in a datacenter. Using DSP, a single developer has the opportunity to create and deploy what might be quite sophisticated mobile applications without any server-side software development. This standards-based, open-source mobile architecture is positioned to enable developers to connect HTML5 and native applications to a wide array of Web services including SQL Data, BLOB Storage, User Management, App Hosting, and External Integration. In keeping with the prevailing industry trend toward cloud computing, the DreamFactory Services Platform is specifically optimized for installation on existing datacenters and cloud infrastructure such as Amazon Web Services and Microsoft Azure. "The client-service architecture is the best choice for low-bandwidth and high-performance mobile applications written in HTML5 or native technologies," said Bill Appleton, cofounder and CEO of DreamFactory. "But hosting mobile applications on your own cloud or datacenter often requires lots of server-side software development  [so we have created] a service platform for mobile enterprise applications. Our value proposition is: software development costs, network bandwidth, application security, cloud hosting bills, time to market and user experience all improved." Developers who were provided early access to the platform said that it addresses a crucial gap in the current line-up of technologies used to develop mobile enterprise apps. According to the company's press statement for this release, DreamFactory offers all of the services and capabilities developers need to build secure, modern client-service applications for the desktop, tablet, or phone. All services are accessed through a REST interface that supports both JSON and XML documents. The document exchange interface minimizes network traffic, mitigates intermittent connections, and provides support for HTML5 applications and native client technologies such as Android, BlackBerry, and iOS.